Hoarding involves the acquisition of and inability to discard large numbers of possessions that clutter the living area of the person collecting them. It becomes a disorder when the behavior causes significant distress or interferes with functioning. Hoarding can interfere with activities of daily living (such as being able to sit in chairs or sleep in a bed), work efficiency, family relationships, as well as health and safety. Hoarding behavior can range from mild to life-threatening. Epidemiological findings suggest that hoarding occurs in 2-6% of the adult population, making it two to three times more common than obsessive-compulsive disorder. The fifth edition of the Diagnostic and Statistical Manual of Mental Disorders (DSM-5) now includes Hoarding Disorder as a distinct disorder within the OCD and Related Anxiety Disorders section, creating a demand for information about it. 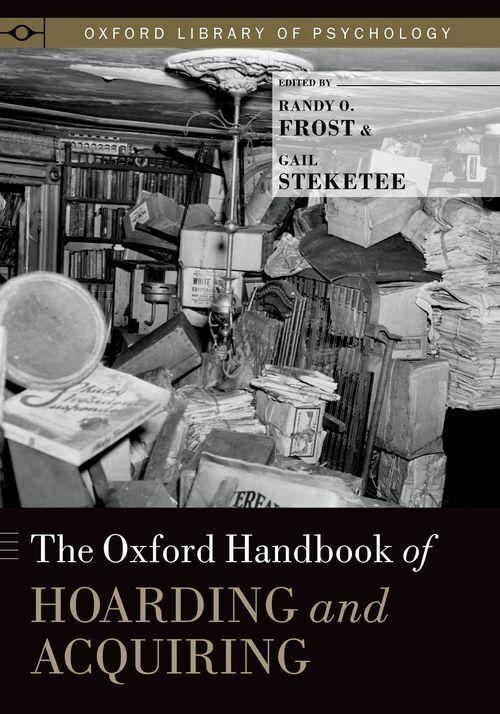 The Oxford Handbook of Hoarding and Acquiring is the first volume to detail the empirical research on hoarding. Including contributions from all of the leading researchers in the field, this comprehensive volume is divided into four sections in addition to introductory and concluding chapters by the editors: Phenomenology, Epidemiology, and Diagnosis; Etiology; Assessment and Intervention; and Hoarding in Special Populations. The summaries of research and clinical interventions contained here clarify the emotional and behavioral features, diagnostic challenges, and nature of the treatment interventions for this new disorder. This handbook will be a critical resource for both practitioners and researchers, including psychiatrists, psychologists, neurologists, epidemiologists, social workers, occupational therapists, and other health and mental health professionals who encounter clients with hoarding problems in their practice and research. Dr. Randy O. Frost is the Harold & Elsa Siipola Israel Professor of Psychology at Smith College. He was awarded the Lifetime Achievement Award for excellence in innovation, treatment, and research in the field of hoarding and cluttering by the Mental Health Association of San Francisco. Dr. Gail Steketee is Dean and Professor at the Boston University School of Social Work, and a member of the American Academy of Social Work and Social Welfare. Her scholarly work has focused on developing and testing treatments for obsessive compulsive spectrum disorders, and especially hoarding. Both Dr. Frost and Dr. Steketee received the Outstanding Career Achievement Award from the International Association for Obsessive Compulsive Disorders.